Announcement I am a pastel painter living in Murfreesboro, TN. My subjects include rural landscapes and florals, especially landscapes of my native Poland where I lived until I was 28. I believe that the emotion you feel for your subject is always visible in the art you create, which is why you should paint what you love, no matter what others say. Love is universal and it carries through across cultures. 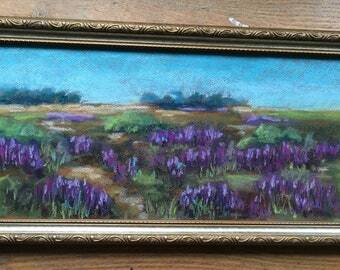 I am a pastel painter living in Murfreesboro, TN. My subjects include rural landscapes and florals, especially landscapes of my native Poland where I lived until I was 28. I believe that the emotion you feel for your subject is always visible in the art you create, which is why you should paint what you love, no matter what others say. Love is universal and it carries through across cultures. I started painting in oils after growing up in Poland in a household where my parents always collected art. Galleries were always on our agenda during any field trip. So I had the bug in me, but it did not surface until I was in my 50s! I started with portraits of my beloved Mother who passed away without seeing my best work. I knew I had a lot of catching up to do, so I painted whenever and with whatever I could. When I picked up a box of pastels, I knew my life would be different. I loved the bright colors, and that you did not have to wait for the work to dry in order to continue painting. Six years later I had so many paintings I needed my Etsy shop! Have a look around. Most of my paintings are scenes from Poland, but ALL of them are subjects I love! Wild and semi-wild landscapes and flowers, animals, people. The latter ones take the most time and detail. I do not paint them every day. But I am always tempted to capture a landscape I drive by--paint it from memory, not being bogged by detail, but remembering a streak of intense color in the grass. That memory --the moment of amazement--will be there when you sit down to paint it--like magic. That's all you need for a painting to have life. Take a peek at the collection--these are my moments of amazement.